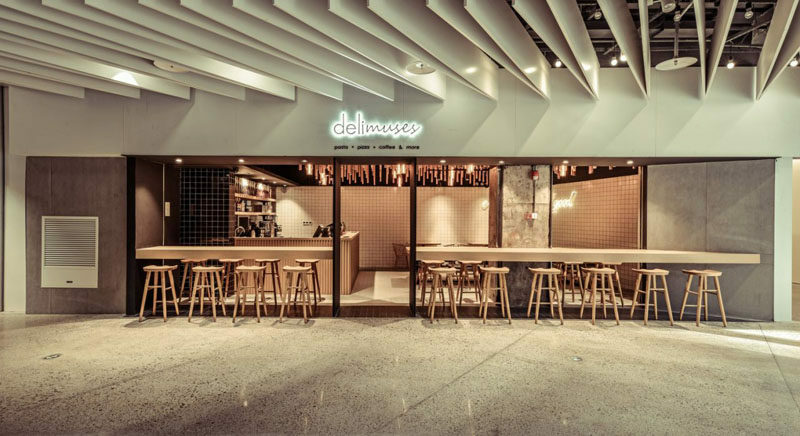 Architecture and interior design studio SPACEMEN, have recently completed a new modern cafe in Shanghai, China, named Delimuses. 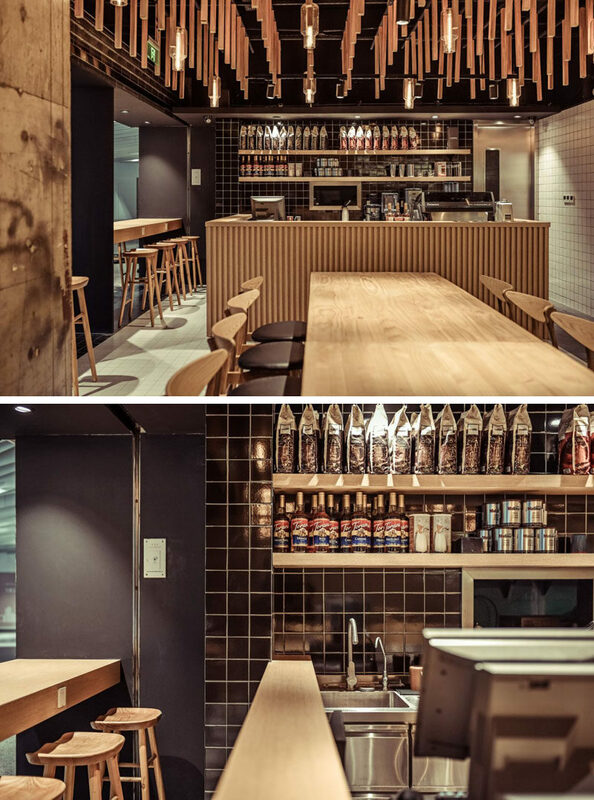 The cafe is located in the lower level of a building popular with office dwellers and shop-goers, and has an open facade with wood bar seating, enticing people to escape the busyness and stop in for a coffee. For the interior of the cafe, the designers took their inspiration from nature. The wanted to create a calm and relaxing place for the customers where they could gather and feel like they are relaxing under the trees, emulating the comforts and tranquility of an open forest canopy. 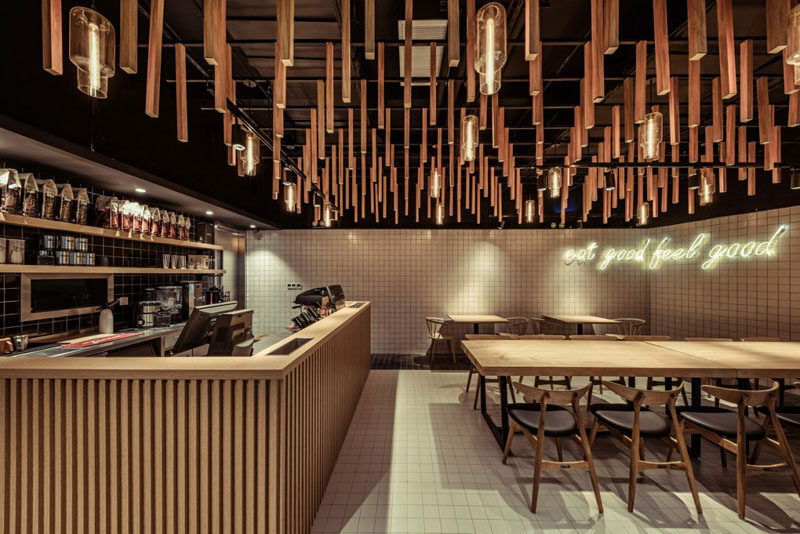 On the ceiling of the cafe, irregular timber pieces mimic the branches and hanging vines of trees. Warm light in the form of pendant lights, filters between the timber branches and mimics drops of rain falling of leaves. At one end of the cafe, there’s a long wood table for communal use, while against the wall are more private tables and chairs. Square white tiles and a neon sign decorate the walls. At the other end of the cafe is the service bar which is surrounded by wood, tying in with the other wood elements in the space. Behind the service bar are some open, floating wood shelves on a backdrop of black square tiles.